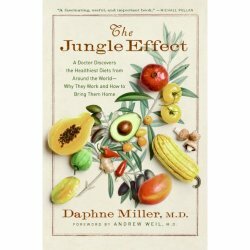 The Jungle Effect by Daphne Miller, M.D. Scrumptious readers, my favorite food book of 2008 is out on the shelves and let me tell you, it's refreshing, exciting, informative and full of terrific insight about how to ensure what you're eating is good for you-- for the rest of your life. This is the first time I've discussed a book on this blog; it's not something I was inspired to do before. But, I was so excited about The Jungle Effect that I wanted to tell you all about it! Recently I read the book and had the opportunity to interview its doctor-author Daphne Miller, M.D. In the book she talks of her travels around the world to research particular indigenous food cultures and brings her findings home to her patients and ultimately, to everyone who reads the book. Are you sick of diets and fads which change at best yearly and at worst, quarterly, preaching what you should eat? Me too. I completely ignore them and try to eat healthy. But, sometimes "healthy" is vague and sometimes eating healthy ingredients doesn't pack as much preventive power as eating a meal with ingredients that when combined in a specific way, help combat specific diseases. This is not another locavore platform. In The Jungle Effect, Dr. Miller delivers insight, research, findings, MEAL PLANS(! ), RECIPES (!!) and SHOPPING LISTS (!!!) for 5 indigenous diets that have the lowest prevalence of specific chronic diseases that plague much of the Western world. She calls these areas "cold spots" for each disease. Copper Canyon, Mexico for diabetes; Crete, Greece for heart disease; Iceland for depression; Cameroon, West Africa for bowel diseases (including colorectal cancer) and Okinawa, Japan for both breast and prostate cancers. The premise is that if you have risk factors or early stage warning signs for any of these chronic diseases, you can improve your health by learning from and incorporating these indigenous diets into your own lifestyle. These are not "diets" in the temporal lose-a-ton-of-weight sense. They are diets as the word is truly meant; the composite of what you eat and drink on a daily basis. Also the point isn't losing weight, although naturally that follows in many cases when combined with exercise of course, but rather it is increasing your longevity and vitality. And don't we all want to learn how to live longer and better lives? Hurrah Dr. Miller! According to Dr. Miller, "...When people take simple baby steps, such as committing to making three meals per week from one of these chosen plans, and include all the items on the shopping lists, they realize they can be successful and are empowered and triumphant!" Inspired by her patients and their stories, she approaches the research with honesty and an eye on what will work in the long term for people. "In order to take charge of your health and body, you must commit to cooking," explains Dr. Miller. "But prior to seeing me or reading my book, none of my patients were even given a recipe as part of the prescription [for their chronic diseases]. It's obvious to me that the main prescription should be a recipe, something that people can do for the rest of their lives." Dr. Miller is a breath of fresh air for those of us who love cooking! Rather than working in stilted lab environments, she traveled the world and studied peoples who have been healthy for centuries and particularly resistant to certain chronic diseases. 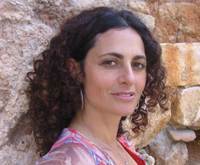 She brings that knowledge home with anecdotes of her patients, combines her research with an understanding of each unique patient's cravings, food history, shopping locations, patterns and how they feel about cooking at home. She uses this information to build a full picture of what food means to her patients and their sense of self. Together, they then set a specific indigenous eating strategy in motion. What's amazing is that these diets have been working for centuries in pockets of the world but no one has ever made this knowledge so practical and accessible at home. Everyone with a supermarket, and in some cases a farmer's market can find and buy the necessary ingredients for these meals. "These indigenous diets are not about high drama. Rather, slow and steady results to effect permanent change are what you see. It's more like turning a freighter around and once on a different course, it's amazing how successful people feel," Dr. Miller told me. Some findings are fascinating in the sense that they are somewhat counter-intuitive to poplar understanding. For example, pork isn't banned and our phobia about saturated fats isn't always valid. Matter of fact it's an important part of the Okinawan diet but is always treated as more like a spice or condiment than a complete entrée. And when combined with other elements of the Okinawan diet, the pork is easier digested and nutrients absorbed. In most cases, she found it's the combination of ingredients that help combat each disease. The book explains exactly how to do this with any of the five indigenous diets covered and provides all the appendices you need to shop, cook and plan your new meals. It's wonderfully unique and full of valuable resources for any home cook, no matter your current state of health or risk factors for these diseases. By reading, understanding and using The Jungle Effect, we can all make sure our cooking is as healthy as we're committed to making it. 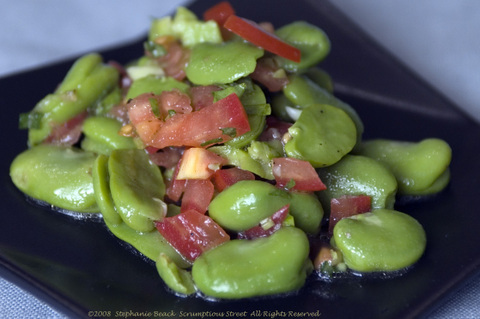 Fava beans are another of my very favorite Spring ingredients and I always peruse the Farmer's Markets for them in April and May. I hit the jackpot this past week and found some Favas that were so beautiful and fresh that I knew I wouldn't want to boil them, sauté them or otherwise cook for very long. Thus, these babies called to be eaten just the other side of raw, barely blanched and in a simple manner to show off their freshest taste. Here is my resulting "Fava Bean and Tomato Salad." This dish was so wonderful but it's not going to work if you don't have incredibly tender and fresh beans. Two great ways to recognize them are that the pods should not contain any black spots and should not feel flimsy or mushy if you gently squeeze them. Should you find good ones, they'll turn anyone into a lover of this healthy legume. Another very important part of this dish was the green garlic stalks. You should also be able to find this at any good Farmer's Market in the Spring months and I chose to use them because they taste of garlic but are much milder and softer, perfect because you can eat it raw, like I did with this salad. I think this is a scrumptious little side salad for all those summer barbeques and is similar to a typical Mediterranean meze or Spanish tapas. I only had a small amount and they're a bit intensive to shuck, blanch and shell so this is just a recipe that feeds two people as a small little nibble. In case you've seen them at the markets but aren't sure how to get the beans out of the funny-looking pod, here's the basic plan. Snap off the top stem and pull the long string along the seam, exactly like you do with fresh snap peas. Pull out the bean inside and put them in a bowl. The beans are covered in a soft, waxy casing that you will remove before eating. So, in essence, you have to shell them twice. Blanch them inside the casing and when done, put them in an ice bath. One at a time, pinch the end of the casing and slice it open with your thumbnail. Push the opposite end of the casing and the inner bean should slide right out. I'm sorry I didn't take photos of the process but there are some very illustrative photos here. 1. String, shell, blanch in boiling water for 2-3 minutes and then cool fava beans in an ice bath. One at a time, shuck the fava beans and put them in a bowl. Add the chopped tomato, basil, marjoram and green garlic. Toss gently with a spoon to mix. 2. In another small bowl add the lemon juice, salt and pepper. Whisk to mix. Slowly stream in the olive oil, about one tablespoon at a time, making an emulsified vinaigrette. 3. Pour the vinaigrette over the fava, tomatoes and herbs in the first bowl. Mix thoroughly and taste, adding a pinch more salt and pepper if desired. Serve either as is, or placed atop a very fresh bed of arugula. Have a great time with this one and believe me, it's worth the effort with the beans and the rest of the preparation is very quick and simple! It's that wonderful time of year again; Morel mushroom season in North America. Having grown up in a beautiful mountainous place where we foraged our own after rainy May days, morels are an "official start of Spring" for me. I adore their hearty, meaty, rich flavor and their magnificent toothsome texture. I haven't hunted morels myself in years but after finding these perfect specimens at a local Farmer's Market I'm itching to get my rainboots and basket out and check out my Northern California forests. It's easy to find them with a good guide after the first couple of days of sun following a little bit of rain. They like to grow in forested or wooded areas and are as prized in some parts of North America as truffles are in Europe. If anyone in the Bay Area knows where I can hunt them please let me know. In the meantime, I'm hitting that market every week through May to stock up on more. 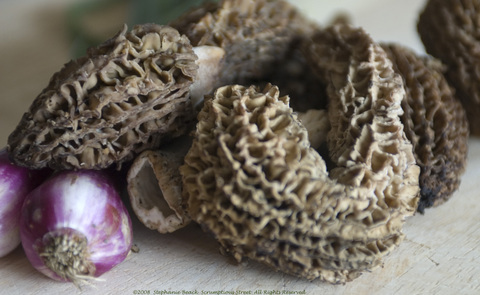 Morels are wonderfully adaptable to most cooking methods and tastes. There always seems to be a joke floating around that morels "taste like chicken" but I couldn't disagree more. They are a unique and distinct flavor that cannot be described, purely experienced. 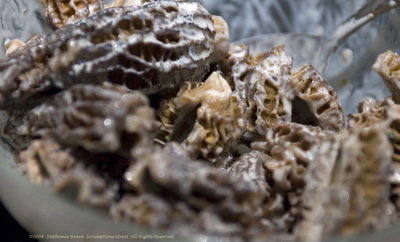 All my years in New York, I depended on dried morels except on a few wonderful occasions when I found fresh ones. However, these are so much larger, heartier, tastier and prettier than anything I found in New York ever. I was so excited at the market I started shrieking and giggling, it's a good thing I was amidst other avid cooks and eaters who understood my joy! My recipe is an adaptation of the classic way my Mom prepared them: fried with corn meal. I took her basic recipe and added a few key ingredients and made a superb marinade to help tenderize them before frying. Wow. They rocked! Here are my "Crispy Spring Morels and Peas". Here's my recipe. It's just a small amount, for two people since the price of these mushrooms is astronomical. They are a splurge but my memories and love of them are so profound that I couldn't resist them. But, just tasty little side dishes, I only bought a little. 1. Prepare and clean mushrooms and soak in a salt-water bath for 10 minutes. It's important to cut off the tough end of the stem and also to slice them open in half lengthwise. You must do this to look for worms (always possible) and to clean out the inside gently with a damp towel. 2. Combine the Worcestershire sauce and buttermilk in a bowl by whisking together. Add the cleaned morels to this sauce to act as a marinade and help tenderize the mushrooms. Refrigerate 1-3 hours. 3. When mushrooms have marinated, put the cornmeal on a large, wide plate. Add the salt and pepper to the cornmeal and mix with your fingers to spread through. 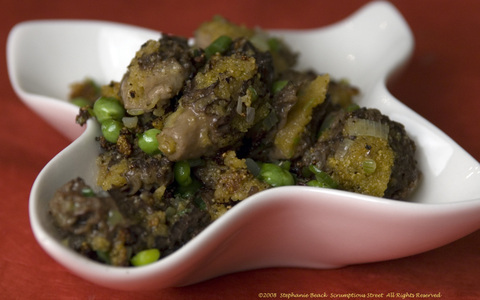 One at a time, dredge the mushrooms in the seasoned cornmeal. Shake off any excess cornmeal and place on another plate in a single layer. 4. In a large non-stick skillet, heat the oil on high and when shimmering and very hot, gently add the mushrooms. Fry until they are very tender but crispy and brown on the outside from the cornmeal, about 6-8 minutes. Toss in the spring onion and peas and fry another 2-3 minutes until the peas are just tender. Remove from heat, and drain on a plate lined with paper towel if there's extra oil. Add another pinch of kosher salt and enjoy immediately!